PCOS – short for polycystic ovarian syndrome is a health condition that affects 1 in 10 women. Literally, it's the development of small fluid filled sacs or “cysts” in the ovaries and it’s caused by a hormone imbalance. Too much androgenic hormones (testosterone, DHEA) and not enough estrogen. PCOS is also linked to insulin resistance or type 2 diabetes. PCOS can result in a host of issues from insulin resistance (type 2 diabetes), high blood pressure, high LDL cholesterol, infertility, acne, excess hair growth etc. I have seen doctors come at this with myriad of drugs to attack the problem from various angles. They can prescribe something like metformin to improve insulin sensitivity. Some suggest birth control to add in more estrogen or progesterone. And some suggest anti-androgens. 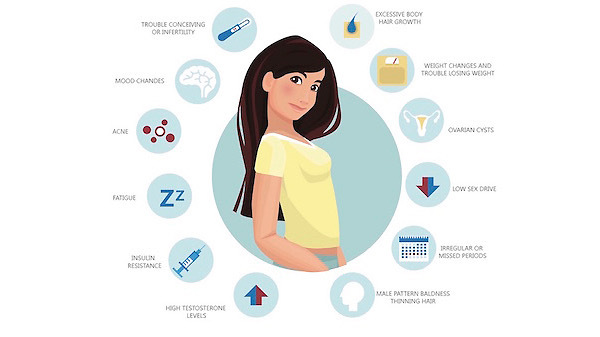 In my experience, as a person who suffered from PCOS as a teenager, all of this can be controlled with lifestyle changes. The key is to be an “upstreamist”. This is an analogy from a Ted Talk and here’s the story… there are people being tossed into a river… most doctors jump in the river, pull people out of the currents, and administer CPR. The doctors who are “upstreamists” instead head upstream to see why / how people are being tossed into the river. Translation – find the root of the problem and address that instead of attempting to cure the symptoms. Therefore, in my opinion, when it comes to PCOS the key is to look for the reasons your hormones are out of whack in the first place and address that! The top reasons are as follows – crap food and way too much of it. Not enough exercise. The crap food can completely screw up your insulin levels and your body’s ability to properly utilize insulin. Plus, chemicals in heavily processed foods and foods sprayed with various pestecides, herbicides, and fungicides can also throw off your androgen/estrogen balance. Fitness, is the number one way to improve insulin sensitivity. So inactivity on top of a poor diet is insult to injury. This is the reason that keto diets are suggested for people with PCOS. The goal is to control insulin levels. That said, it’s unnecessary, extreme, and comes with other unwanted side effects in the long term. Exercise between four to six 30 minute sessions a week. Train with HIIT intervals and resistance training as those techniques are most effective at accelerating insulin sensitivity. Avoid all processed carbs as often as possible – no white flour and no white sugar. Vegetables, whole grains, and a couple servings of fruit a day are ideal. Make sure you have a healthy blend of macro-nutrients in each meal to balance blood sugar. So healthy fats, clean protein, and complex carbs combined in all meals is optimal. Go organic as often as possible – especially when it comes to meat, dairy, and thin skinned fruits and vegetables. Don’t overeat. If you have weight to lose keep your calories around 1400 a day until you are at your goal weight. If you are at your goal weight make sure to match your calorie intake with your daily calorie burn. Stick with this plan for 6 months and I’m extremely confident you will experience a total 180 when it comes to your PCOS symptoms. The holidays can be a stressful time where we “fall off the wagon” when it comes to our health and fitness, but it doesn’t have to be this way.